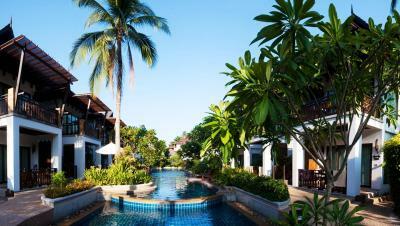 Lock in a great price for Railay Village Resort - rated 8.5 by recent guests. The hotel is set in a tranquil setting with lots of trees and flowers. Staff were friendly and the rooms were very comfortable. 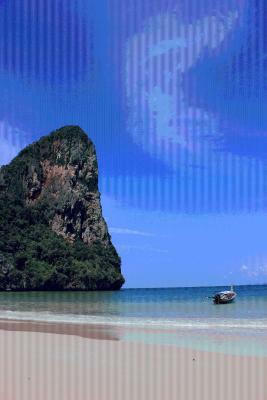 Fantastic location in the middle of Railay Beach, with friendly staff and a good restaurant. We loved the location, the pool and the staff at reception were very friendly. The staff at the restaurant were not so friendly unfortunately. Breakfast was average. Amazing location. Kayak rentals steps from the front desk. Friendly staff. I would highly recommend a stay at Railay village resort. We couldn’t have asked for a better stay. The location, the scenery, the accommodation, it was all second to none. It’s right on the beach front and a stones throw from walking street, which hosts a variety of restaurants and bars. Great location and the pools are nice. 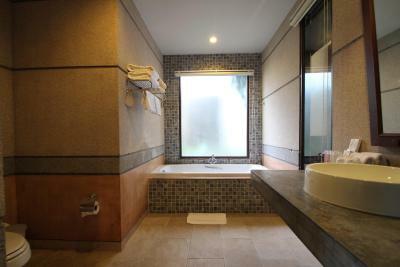 I enjoyed my villa with spa bath and thought all facilities in the room were great. We were upgraded to a villa room which was amazing and comfy. All staff were nice and helpful. Swimming pool located in between rooms and a garden was the best of our resort stay. The resort is entirely surrounded by limestone cliffs and is only accessible by boat. 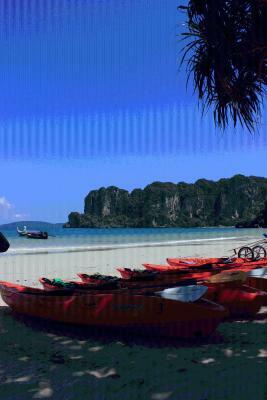 Ao Nang Beach is a 15 minutes' boat ride away. 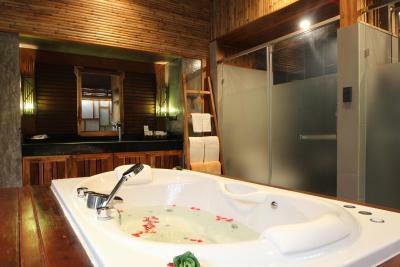 All villas and rooms are fully furnished and include cable TV, private balconies, minibars, and 24-hour room service. 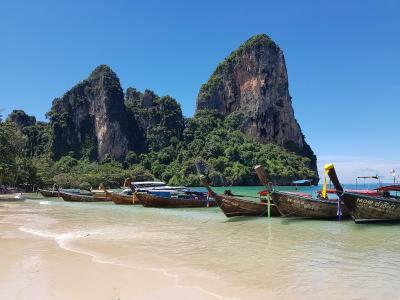 Guests can enjoy activities such as snorkelling, exploring caves and mountains and short-distance boat trips to several offshore islands including the world famous Phi Phi Islands. 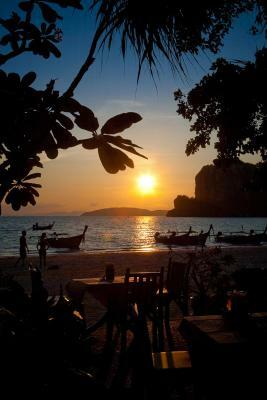 Railay Village's Beachfront restaurant serves fresh seafood barbecue dishes, Thai and international cuisine with a backdrop golden sunsets and sounds of the beach. 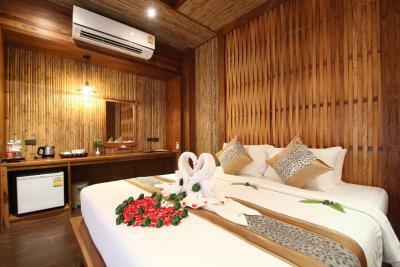 Railay Village Resort has been welcoming Booking.com guests since 3 Jun 2010. 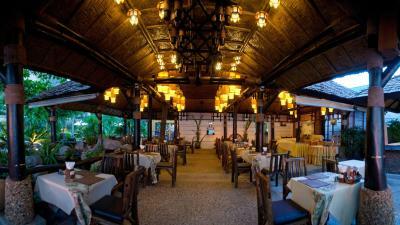 When would you like to stay at Railay Village Resort? 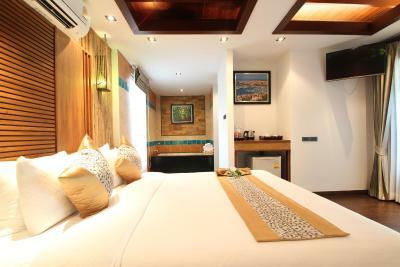 Air-conditioned room features a private balcony with pool view. It comes with a cable TV, a DVD player and minibar. 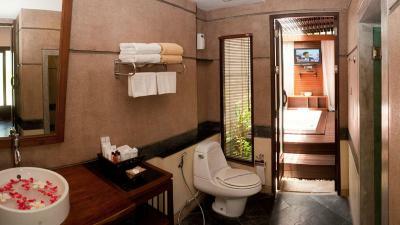 A bathtub, a bathrobe and a hairdryer are included in an en suite bathroom. Spacious villa features a balcony with private gardens, 2 cable TVs and a DVD player. 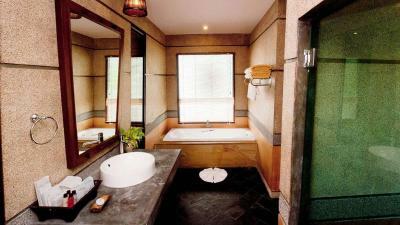 A spa bath, a bathrobe and a hairdryer are included in an en suite bathroom. This family room features air conditioning, seating area and DVD player. House rules Railay Village Resort takes special requests - add in the next step! Railay Village Resort accepts these cards and reserves the right to temporarily hold an amount prior to arrival. Please note that room rates on 24 Dec 2019 and 31 Dec 2019 include a gala dinner. Extra guests will be charged separately. Please note that this property is accessible only by boat. 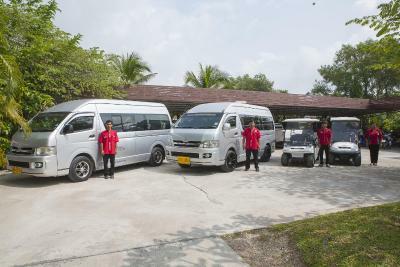 Guests are suggested to take a taxi to Ao Nam Mao Pier or Aonang Beach to take ferry service. Please note that the name of the credit card holder must be the same as the guest's name and credit card must be presented to the property upon check-in. If you are booking on behalf of someone else, you must contact the property directly, using the contact details on your booking confirmation. The staff at front desk wasn’t trained to work in a resort. You had to be on top of them to organize check out and airport transfer. They charge a cash deposit on the check in that was never mentioned before. One lady at the transportation desk tried to charge me 2000 bath to the airport when the real cost is 1600. The facilities are old and in need of an update. Breakfast was very basic. Perfect location by the beach. Breakfast could be improved a bit. They show me room on the first floor when you go out you right in the pool, however the gave me room in the 2nd floor. I was hoping the have more AMERICAN options on the breakfast. I liked the location it’s right on the beach , it’s very very clean and quite. The stuff are friendly and nice it’s was wonderful. The bed size, the room size, the pool. This hotel is a little difficult to get to as you have to arrive by boat but if you set up in advance the staff will pick you up at the airport. Only ate breakfast here - it was lacking but the view made up for it. Beach at this hotel is incredibly beautiful, rooms were spacious and the staff was very accommodating. The mastress are perhaps a little bit to hard but it is not really a big issue. Another thing which is not really due to the hotel is that you can find quite a lot of jellyfish on the Railay west beach and the ones nearby (Tonsai, Phranang), we didn't know it before and this was quite annoying. We had a double room in front of the swimming pool. To reach it, from the reception you walk in direction of Railay East, first there is the big swimming pool on the left and a restaurant on the right, just on the beach (where you have the breakfast with beautiful view to the sea/beach), then there are all the villas and then you reach two building one on the left , one on the right and in the middle a swimming pool. It is only about 150m from the beach. The "chaise longues" are quite quickly busy but we haven't spent so much time there apart from using the swimming pool from time to time. 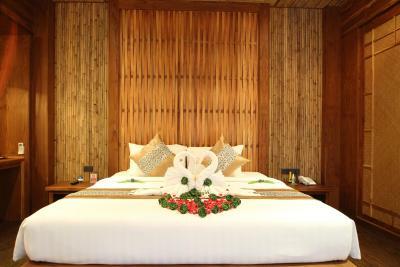 They decoreted our room (and bed) as honeymoon and when we entered into it it was really beautiful, with lots of flowers! The room is really good isolated and you do not hear the music of the bars in the "animated" street nearby. Lots of space within the room and we really enjoyed it. You can walk to the other beaches nearby and there a a lot of restaurants/bars around. Breakfast very poor.. always same dishes 2 swimming pools but almost no sunbed .. It would be better if the hotel had a large water dispenser where we could fill up our water bottles instead of needing to constantly buy new plastic bottles. Having said this, it was good that the two complimentary waters came in glass bottles. The property is beautiful. The two pools are secluded, beautiful and relaxing. The sunsets from the beach are unreal. Our room was spacious and very nice. The bed was extremely hard and uncomfortable, the rooms weren’t cleaned to a high standard and there weren’t enough sun beds by the pool.